I’ll begin today by summarizing my last post, orient this post toward an educational view and consider what it might mean in terms of the practical elements of a network learning platform. When we look at our everyday activities and the communities where those activities are embedded, what becomes important in enabling our actions is not rarified decontextualized content knowledge, but rather the knowledge and understandings that are fashioned between us. We are shedding the industrial era hierarchal rule based structures because they no longer fit the complexity we face, a complexity that now require collaborative ways of working. We are also switching from a focus on the prediction and control of behavior to the joint pursuit of emergent practices and from what is the case on the ground, to what values we ought to pursue on behalf of our customers. Learning in this view does not have a measurable essence, but it can have a use, which can become meaningful when it enables joint action. It’s an approach to Dewey’s learning by doing that centers cognition in collaboration. Time to get concrete. How do you help people not only learn, but also develop their capabilities? Previous educational world-views are looking unsustainable and it’s only increasing given the trends toward what David Jones calls The Commodification of Knowledge. (The) fundamental problem that I see in this (commodification) response is a limited and incorrect view of higher education. . . . It’s a market driven, techo-rational approach that assumes a traditional analyse, design, implement, evaluate cycle that fails to understand the full complexity of what is required and the changing nature of surrounding environment. . . . It assumes that there are people who are smart enough to predict what “consumers” will want from the University. This is similar to the problem of push as described by Hagel, Brown & Davison (henceforth HBD) and their answer to my question is similar to David’s suggestion: Focus on what you do well, build a learning network around that, and allow the emergent practice to grow. Sounds like a Personal Learning Environment (PLE) supported practice. So what are the elements on which to build a high functioning PLE? What do you need to develop and grow your practice? Build a diverse, visionary and engaged learning network. HBD suggests that you find the smartest people in your field (what you do well) to include in your network. Get into their networks, learn what problems they’re attempting to solve (presumably the same problems you are or will encounter) and work jointly on solving them. The time to build that network is now. It’s too late to start when a pressing need arises. I think there needs to be sufficient similarity to allow connections to form in any network, but there is also a need for diversity. Achieving high levels of both is an important goal. You can not predict where the next important idea or resource will come from in HBD’s world of “pull” learning; serendipity plays a great role. This means that your daily environment is almost as important as any wider, but occasional network. This fits in with an idea (mostly from Richard Florida) that we want to be in diverse, vibrant and exciting environments. This isn’t pie in the sky thinking. If you’re in a field that needs innovation (and what field doesn’t today) a diverse, vibrant and exciting environment is a worthwhile business investment. I see this concept serving many more and differing goals than is possible in a traditional course. At one level it is a people curator, a natural network supporting device. It’s is likely where the “smartest people in the room” will be (except that in a world ruled by serendipity, many people may become the smartest person at one time or another). It is a place where the field leaders can connect with people and network their leadership role without becoming overwhelmed by the demands of the network (at least I hope the leadership in this course would concur). People involved will have many differing goals, but I think that a MOOC will be most beneficial when it is understood as something larger in purpose and more connected with the world and with people’s everyday activities than a traditional educational course. There may also be other forms in the future that fulfill a similar role, but this seems like a good start in defining a network learning platform. (S)omeone who is aware of the networks around them and explicitly works to make them healthier (more inclusive, bridging divides). Network Weavers do this by connecting people strategically where there’s potential for mutual benefit, helping people identify their passions, and serving as a catalyst for self-organizing groups. There are many potential roles in a network, but one of the most valuable may be that of a connection propagator in a fluid network that is able to change with the needs of its members. An unconference is a facilitated, participant-driven conference centered on a theme or purpose. . . . (and that tries) to avoid one or more aspects of a conventional conference, such as high fees and sponsored presentations. I’m looking at the concept of the un-conference as networked, distributed and collaborative open research. More focused and directed than other network forms, but one that may help to round out the different types of network learning and development platforms that serve important purposes in people’s practices. This is a beginning list and I would welcome any additions and ideas. I don’t consider myself an expert, but I’m strongly interested in better understanding this project we’re involved in as a new type of learning and development platform. Comments encouraged! In my last post I alluded to some counter-intuitive ways that I think learning is becoming different. This post addresses that issue in someways by drawing on this McKinsey article. Most people’s idea of learning comes from their experience sitting in classrooms reading from textbooks, memorizing spelling lists or completing practice math problems. This is a far cry from what social networked or “pull” learning is all about. Because they have this mind set, many aspects of “pull” learning can seem counter-intuitive. In order to understand people will need three things. A new narrative explaining pull learning. When a majority of people want things that remain priced at a premium under the old institutional regime—a condition I call the “premium puzzle”—the ground becomes extremely fertile for wholly new classes of competitors that can fulfill the new demands at an affordable price. . . . today, we are moving from an era of mass consumption to one focused on the individual.
. . . Instead of “What do we have and how can we sell it to you?” good business practices start by asking “Who are you?” “What do you need?” and “How can we help?” This inverted thinking makes it possible to identify the assets that represent real value for each individual. Cash flow and profitability are derived from those assets. Once valuable assets have been identified, they must be rescued from old, costly industry structures that keep them from serving individual needs in a cost effective manner.
. . . (Bypass) existing institutional structures—human, physical, organizational, technological, or financial—and connecting individuals directly to the assets they seek. . . . bypass the unnecessary costs, outdated assumptions, and value-destroying practices of legacy systems. Allow customers to reconfigure . . . assets according to their own values, interests, convenience, and pleasure.
. . . offer consumers the digital tools, platforms, and social relationships that support them in living their lives as they choose. Just as Shoshana suggests that CEOs should “question the old logic and vocabulary of competitive strategy”, so should we ask those supporting learning to question the old methods, pedagogy and vocabulary that may very well remain stubbornly in place across the spectrum of learning opportunities. Focus our attention on learning that is “affordable to few but desired by many”. Access hidden assets especially those on the edge or even outside of organizational boundaries. You do not need to control all the assets that are needed to meet customer expectations. Constantly probe the end users desires and needs as a strategic commitment. Most of all, Shoshana notes that distributed forms currently exist in digitalized internet spaces, but need to be matured and extended to face to face situations, which he terms the next test for distributed capitalism. Can distributed capitalism go further? What happens when it confronts forms of physical assets and social support that cannot be reduced to information—arenas where face-to-face experience is essential? This is when distributed capitalism, which until now has manifested itself almost entirely in the digital world, will begin to mature as it takes aim at core economic functions with a second wave of more complex mutations that combine virtual and real-world assets. This post is a response to readings (week 1) in the MOOC, PLENK 2010. The (network and the collection of resources) becomes a PLE when the integration of resources starts to include the work and voices of others as readily as a student’s own critical reflection and scholarly work. So again, my question is; is this a “personal” or a “social networked” learning environment? I think the continued use of the term “personal” in someways reflects an over-individualized view of learning that now, in the context of networked learning, can be seen as more inadequate than ever. I also think it is more than just terminology. Many aspects of networked or “pull” learning tend to be counter intuitive. In order to really appreciate this new paradigm I think many people, especially in the business world, will need to suspend their common-sense ideas about what it means to learn. I think I’ll attempt another post on this theme. Learning has always been multifaceted, but where the old concrete model of learning activity was exemplified by the classroom, a new concrete model of learning activity will be exemplified by a network. It’s not a change in what learning is, but more of a change in the why, where, how, and when learning happens. Why New Ideas for Learning are Needed. The pace of market change and creative destruction is increasingly requiring innovation and adaptive responses just for business survival. John Hagel points beyond product and process innovation ot the need for institutional innovation is we are to counter the movement of innovation to Asia. The complex understanding and responses needed requires greater access not just to to innovative ideas, but also the social spaces that contain both knowledge flows and the diverse capabilities needed to actualize those ideas. Businesses need to move beyond the traditional boundaries of the firm. Human development, once thought to be relative unchanging after age 25, now highlight the ability for all kinds of growth in mental complexity and ability throughout one’s active adult life. In response, new theories of performance are now available to support development and increase performance throughout one’s career. The next section explain some background behind this categorization. Traditionally the classroom was led by an expert who was guided by a set curriculum and a transfer metaphor of learning. In contrast, the network contains a diverse array of individuals interacting with learning as an emergent phenomenon. This is not to say that experts, classrooms and the transfer metaphor will disappear, and learning, as a psychological and behavioral phenomenon, will not change. It’s just that the most valuable and ongoing form of learning will emerge through network participation and will emphasize it’s natural connection with relationships and activity instead of focusing exclusively on knowledge content. It will bypass the problem of learning transfer through learning in situ, in a just in time manner. Instead of teachers, we will depend on a variety of people who’s role will be more like a guide, facilitator or collaborator. Network learning has a built in efficacy benefit in that it’s so closely tied to activity and action in which the learning subject is engaged. In a recent Charlie Rose episode Daniel Wolpert mentioned that the only purpose for a brain is to enable complex adaptive behavior through the motor systems and that the motor cortex and muscle system is the end-path for all of our sensory systems. To think of content and knowledge as separated from activity is to ignore the way the brain is inherently organized. Just in time network learning is tied closely to enabling action, which is more in line with the natural organization of brain systems. If for no other reason, this type of learning is productive because it replaces the huge amount of knowledge that is committed to memory just in case it might be needed in the future with targeted knowledge that leads directly to action. While learning is just in-time, building robust and diverse networks is the preparation we need. When you need resources is not the time for network building. The network building that taps us into vibrant engaging relationships and social spaces should be an ongoing activity. The support needed for this are learning institutions, but not like institutions of the past. Not the institutions that horde experts, but ones that foster these vibrant and engaging social spaces and excel at building business relevant social networks. This does not succeed by some network magic. Networks need to be filled with passionate and talented people. You need to be hooked in with the smartest people on the block, just as they need to be hooked in with talented and passionate you. I believe that learning as a psychological and social phenomena is not substantially changing, only the focus of learning will be on the activities and challenges we face. I will rely on an older model of Vygotsky and Leonte’v to explain a model of the architecture of human activity. Vygotsky gave three poles that combined to drive human activity: a subject, a mediator (tool) and an object, all leading to an outcome. 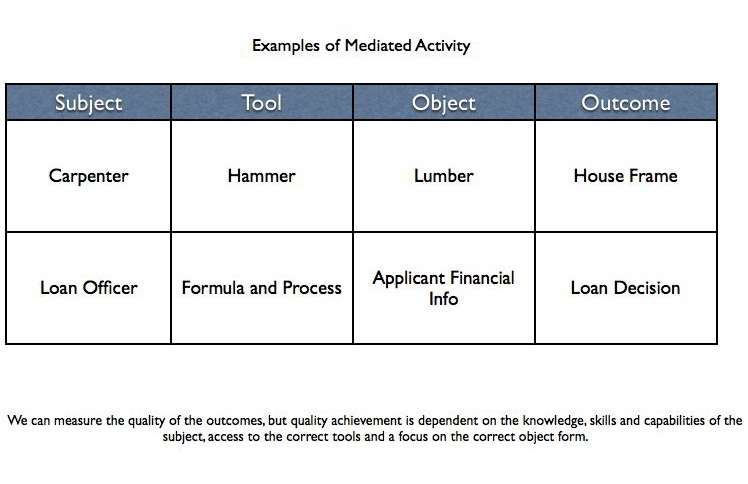 This table gives examples for a carpenter and a loan officer. People who can guide us and give us nudges in the right direction, in a timely fashion while on a self quest to complete this mission. The idea of “pull” (Hagel Brown & Davison, 2010) encourage us to get involved in relevant networks and tap into the knowledge flows existing there. Richard Florida points out the importance of vibrant and engaging social spaces as a key driver of innovation related to business growth. Developing psychological based performance supports systems such as interventions to develop individual psychological capital (Luthans, 2008) or developing the psychological means for personal and organizational change (Kegan, 2010). Opportunities for collaborative practice -based research (eg. localized unconferences) to maximize development and learning within or around one’s specialities. Opportunities for creating and maintaining mentoring as well as other diverse types of relationships within one’s local environment. Networks that are institutionalized to allow you to pursue and developmental goals and identities while conducting business. I say institutionalized to mean that the infrastructure may need to be created and supported. Like Hagel’s “Pull”, we rely on serendipity for opportunity, but we plan to make serendipity more likely to happen. This is not the end of my “theorizing” but a good summation from which to begin a more active research process.